Safe motoring depends heavily on your brakes functioning at their best. This complex system incorporates hydraulic and mechanical functions with advanced electrical components. All it takes is one worn-out part or broken wire for your brakes to work less efficiently and trigger your ABS light. If you’re driving down Antioch or Lenexa Drive and your brakes just don’t feel right, come to our shop on 87th Street for your brake repairs. For 30 years, New Concept Auto Service has been the best choice for safe, reliable brake repairs in Overland Park. Our team of experts is honest and professional, performing high-quality brake repairs while providing our clients with exceptional customer service. 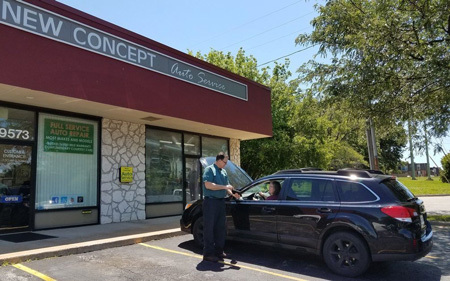 At New Concept Auto Service, each of our master technicians are ASE-certified, making them fully qualified and well-versed in brake repairs of all types on all domestic and most foreign makes. We aren’t your average shop — we use only the best aftermarket and original equipment parts and fluids for long-term brake repairs. You will never question if your car will stop when you press the brake pedal. We believe in performing periodic brake system maintenance which makes your brake system last much longer, plus eliminates noise and vibrations. We always perform a complete inspection with pre and post test drives on every brake concern to ensure the right brake repair is identified, saving you time and money. We communicate the required repairs with you in detail so you are well educated on your vehicle’s needs. We perform only the repairs you authorize and won’t pressure you into repairs for which you aren’t prepared. At New Concept Auto Service, you can rest assured that an ASE-certified technician is working on your brake repair. We have the expertise and training to repair any concern that pops up, from fluid leaks to worn out parts. We perform brake repairs on all domestic and import models, regardless of the vehicle’s age. We have the necessary diagnostic tools and the repair technology to efficiently and accurately perform your brake repair right the first time.